My reflexologist introduced me to this book. Its title sounded like a book on project management so it resonated with my thinking framework and my professional need at that moment. I needed to emotionally realign myself in a period of turbulence. And times of turbulences are not rare in project managers lives. Moments of anger, disappoitment, feelings hurt, fights, pressure are part of the life in project management. Your heart accelerates, your breath is short, you can’t think straight, your self-esteem might have been hurt… If you have a good self-awareness, you know what to do and how to get back to the safe and sound harbour. If you are looking for help, this guide can offer it. Hence, i am sharing it here for any fellow colleague to refer to in times of need. I read it in one go. The author kept his promise to keep it simple and understandable for a non-professional audience. 365 means 3 times a day, 6 times a minute, 5 minutes. All you need is your breath and mindfulness. And a quite space. 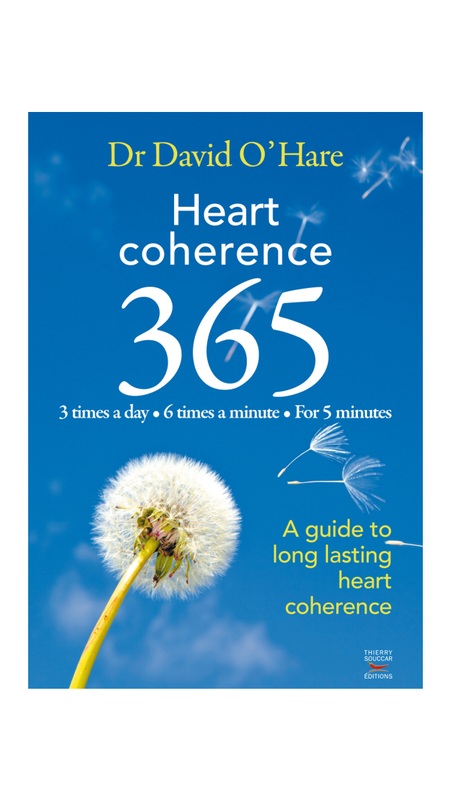 The guide offers detailed explanations on how to reach 365. The 365 is the foundation i was looking for in my modest yoga and meditation practice. If you are curious to learn more, visit http://www.coherence.info. 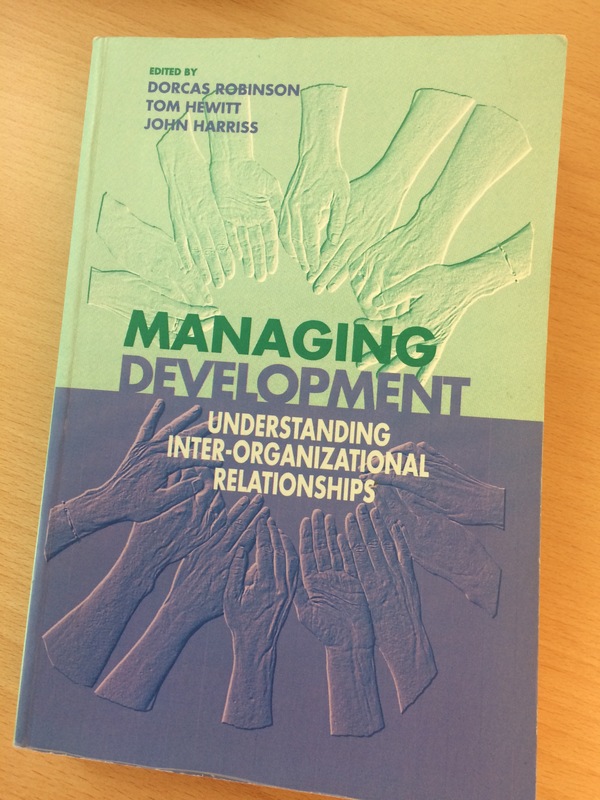 I often go back to this book I got during my studies for the Development Management degree at The Open University. I offers insights from twelve professionals in a variety of development management fields. It is edited by Dorcas Robinson, Tom Hewitt and John Harriss. The book essentially answers the question: how can relationships between organisations be managed so as to build the public action and outcomes desired from development interventions? It explores the diversity of inter-organisational relationships which exist in reality and the array of relationships which are being promoted by policymakers. In this book, partnership is taken to be just one form of inter-organisational relationship amongst many. This book is enlightening on other forms of engagement between organisations captured by terms such as alliance, network, federation, coalition. It makes you more aware of important forms of non-engagement or dis-engagement at times when you wonder what happened to what you though as a strong partnership. The 3 Cs of inter-organisational relations – competition, co-ordination, co-operation – are debated and analysed. The book concludes with a case study and practical advice into making inter-organisational relationships work. New to the job, I had a silent prayer in my head: “Please don’t let me fail”. This fear of failure was almost paralyzing. I only conquered it when i learned to learn from failures. It took a number of failures to get there. Then I learned that i am not alone thanks to a number of books, among which a World Bank publication i would like to share with you. Rule 1. Make it about how. Rule 2. Keep your champions close and your critics closer. Rule 3. Informal networks matter – use them. Rule 4. Unclog the pipes. Rule 5. Build the ship as it sails. A. In many cases failure is „baked into” the project almost from the start by managers and team members who simply fail to be mindful of the details and who focus on avoiding the obvious problem spots that any project will face as it goes along. B. „Build the ship as it sails” suggests to start on a smaller scale and pilot whenever possible. Keep learning. C. The definition of success will vary, depending on who assesses it. Making a difference to people on the ground is a mark for projects making progress in development. D. Regardless of whether the stakeholder is a champion or a critic, these relationships must be managed to avoid project failure (the book includes a tool to manage stakeholders relations). It would be rather boring, I would say, to have a fail-proof project. From time to time I let some failures occur. For a variety of reasons. One of not-so-distant-in -time failures of mine was to draft the project’s work plan based on an overly estimated partner’s commitment. An unexpected management change in the partner organisation demanded a serious rethinking of the implementation approach through for example resource- consuming alliance building and bottom-up approaches. I have on my desk a brochure with the nice faces of the previous management of the partner to remind me not to let my over-optimistic outlook to take over pragmatism in project planning. Failures are the learner’s best friends in projects life and in time i learned to identify and address them. Reasons for failures in projects are multiple and the approaches to deal with them differ. They therefore deserve a separate post, to which i’ll return. In the meantime, a fail-safe and learning rich project management! I grew to understand that you can learn about how to manage a project from a variety of sources, even from watching ants in the process of building their nest. If you are still not convinced about this less conventional source of knowledge and your learning style is more visual or if you just want to listen to a good talk here is a selection of 6 Must-Watch Ted Talks on Project Planning and Team Management, by Meeta Sharma. Enjoy! A useful reading for anyone involved in advocacy and campaigning for good causes. Project managers might find it handy, when implementing change and dealing with stakeholders. Contrary to first impressions, this is not a biology book. Animal images are metaphors the author uses skillfully. The polar bear is an image of a survivor in spite of harsh conditions it lives in. The Killer Bee gives a clear sense of why aggressiveness does not work well with sustainability. The description of a Sea Otter gives a sense of playfulness to learn from. The book is centered around the author’s personal journey from sadness and loneliness to pride and arrogance and invasiveness. All to the detriment of causes he believed in, but failed to secure the support they needed. As the book unfolds, evidence from science comes in smoothly. The big secret he shares is to leverage your emotions and listen to people. Make your passion less about you and more about communities. Anger and pride cloud judgment. Courage and acceptance have a funny way of leading to truth and mastery. This book is about how to create positive change for someone. “Focus. Be selective. Work smarter not harder. Be more strategic. Leverage your emotions. Do not be taken over by them. Avoid burn out. Eliminate stress” advice which is very much valid for the project management world. – Focus on similarities instead of differences to understand. – Change and organisation need each other. – Change is difficult, even when it’s positive. – Maintain integrity while building trust. – Be playful, not pushy. – Story telling is a critical skill. On couple of instances, I missed the interpretation of exercises’ results and an analysis of what to expect from them. At the same time, the book offers free tips via eco-influence website and real world, easy-to-use examples. The author uses neurological science to prove his points. And for more, warmly recommend to immerse yourself into a stress-free journey for anything you’d like to achieve. Happy and Stress-free sailing to all! -What are you reading now, Oxana? -“The Project Manager who smiled”. -Did you write the book? asked my good friend Frank. -I wish. It’s Bob Taylor’s book, i smiled in response. -See, it could be easily about you. I do smile. Indeed, a lot more than at the beginning of my project manager’s path. I believe now in the value of fun in project management. Walt Disney’s saying “It’s kind of fun to do the impossible” resonates with my believes as project management is often about making the impossible possible. I discovered the book 3 years ago. I wish i met it and Bob Taylor at the beginning of my project management path. Hence the reason I share it here. It is one of my favourite books so far on project management. The book is about having fun and being productive. In its Foreword, it brings the evidence of linkages between fun, good mood and healthy atmosphere and, ultimately, productivity. It is unorthodox in a tools-templates-square–linear thinking project management world. Nevertheless, the book talks to you on pragmatic levels, from project manager to project manager, regardless of the size or location of your project. It relies on a wealth of other project managers experience for things tried and workable approaches. It puts a smile on the reader’s face and makes sure it stays there till the end. The author is brave enough to give personal examples and stories, showing that there are gains in vulnerability. For example, in a moment of despair walking out of a room full of team members, closing the door and in a loud voice pretending to be a boss firing him in a very loud voice. You’ll not often find “expectations management” tackled in project management books. It has its place in this book. The book gives workable approaches to the management of expectations through e.g. constant feedback mechanisms. It gives reassurance that creativity has its place and role in project management, making it thus appealing to more creative spirits who want to do project management. Each chapter on Fun Inspiration, Fun Jokes, Fun Motivation, Fun Status, Fun Ideas, Fun Theme Tunes, Fun Team is followed by a PM Celebrity Gossip, sharing reputable project managers’ experience and projects’ successful fun stories. You can really relate or have an aha! moment in these gossips. Recommend it! Works both in project management and in overcoming storms at home. My kid will certainly respond with a smile if, in a moment of unhappiness, I’ ll point a finger at her with ”don’t you dare smile, do not even think about smiling”. Enjoy the book!